Bathing in the river, Calcutta. 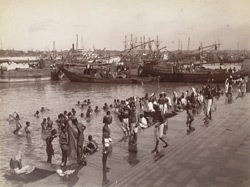 bl.uk > Online Gallery Home	> Online exhibitions	> Asia, Pacific and Africa Collections	> Bathing in the river, Calcutta. Photograph of bathing in the river at Calcutta from the 'Bellew Collection: Architectural Views in India' taken by an unknown photographer in the 1880s. The long, stone-stepped embankments lining the riverfront are called ghats.